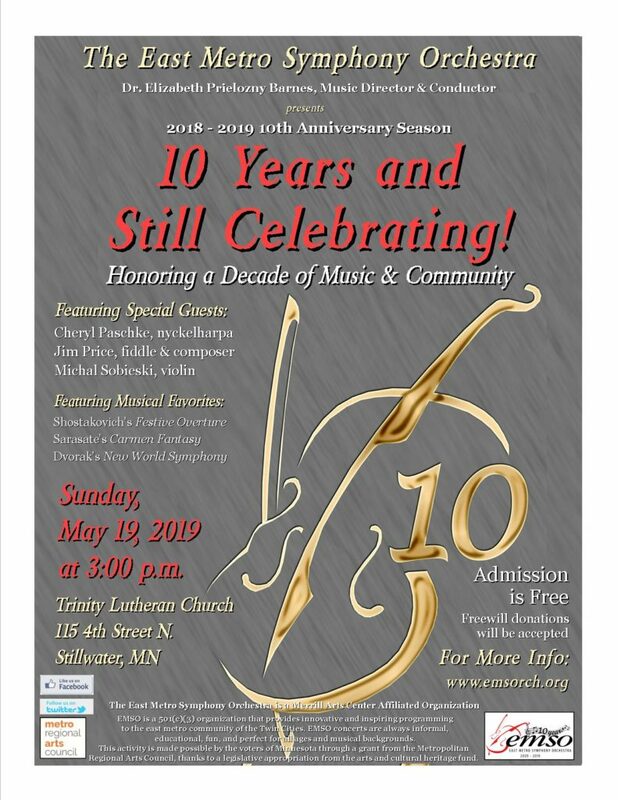 EMSO’s final concert of its 10th anniversary season will recognize and celebrate some of the best music, moments, and friends in the orchestra’s history. EMSO is known for its unique collaborations with remarkable artistic partners and its accessible presentations of a variety of musical styles including classical music, folk and cultural music, and new compositions. Some of the orchestra’s favorite artistic partners will join the orchestra to celebrate this special concert, including violinist and former EMSO concertmaster Michal Sobieski; renowned nyckleharpa (key fiddle) performer Cheryl Paschke; and composer and fiddler Jim Price. Musical performances will include Shostakovich’s Festive Overture, Sarasate’s Carmen Fantasy,Karl-Johan Ankarblom’s Knuss Olles Livsstycke, selections from Jim Price’s Violin Story, and Dvorak’s New World Symphony. EMSO will also honor several of its most influential members and partners during the concert including EMSO artistic director and conductor Elizabeth Prielozny Barnes, who is celebrating her 20th and final season with the orchestra. A meet-and-greet with orchestra members and refreshments will immediately follow the performance.